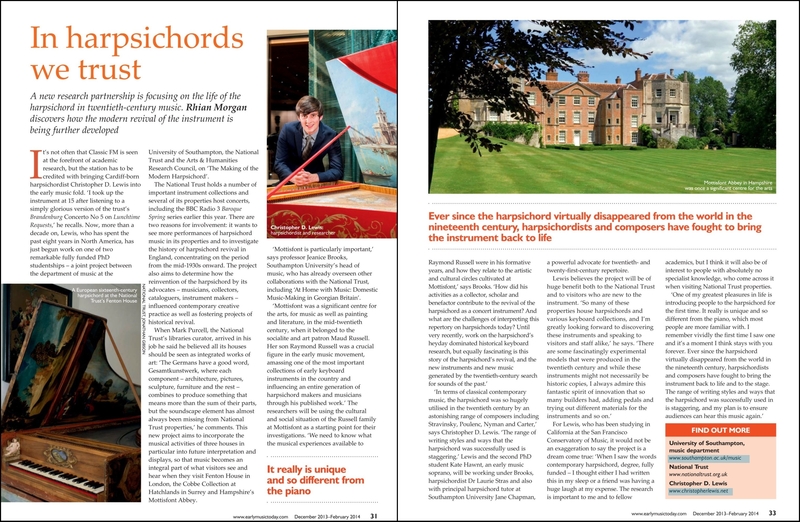 ​I am currently completing a Arts and Humanities Research Council funded PhD at the University of Southampton (in conjunction with The National Trust), exploring the fascinating rise and fall of the 'revival harpsichord' in the twentieth century. In the modern era, an entirely new kind of harpsichord was developed, one which composers of the day set about creating new music for. As time progressed, attitudes changed, and emphasis became strongly in favour of historic reproductions of the instrument. As such the revival instrument quickly fell out of fashion. I have researched into how the unique capabilities of the revival instrument factored into contemporary compositions for the harpsichord. I consider if the principles of historic performance practice should be extended to the revival instrument, when it comes to performances of contemporary music written specifically for these kinds of harpsichords. ​I also explore the role the harpsichord played in film, television, and pop music appearances in the modern-era and consider how composers drew on the nostalgic history of the instrument to compose modern music for it. I am especially interested in the occasions when the harpsichord managed to totally disassociate itself from its own historic past in contemporary music making. A revival harpsichord, manufactured by Pleyel & Cie, can be heard on several of my recordings of contemporary music, including: British Music for Harpsichord, 20th Century Harpsichord Music, and Persichetti, Harpsichord Sonatas. An article from Early Music Today, on the current research project can be viewed [here].